← Hill Country Coffee Shops, Hotels and other businesses face possible lawsuits for offering Wi-Fi to customers! 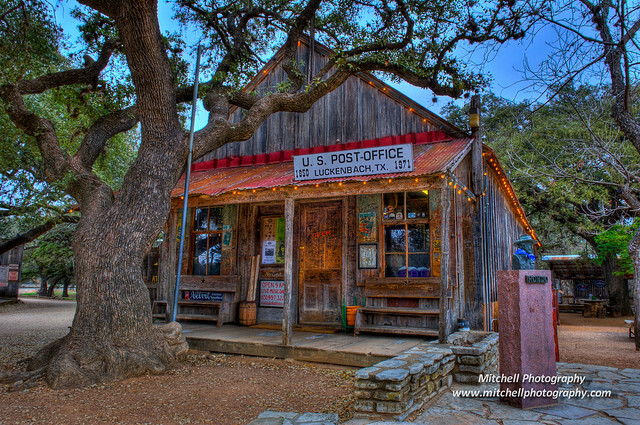 Although the post office at Luckenbach, Texas was closed in 1971 and its zip code of 78647 was officially retired, It remains the most photographed post office in Texas. Although the sign out front says “1850” conflicting records indicate the town was founded sometime between 1846 and 1886. The population increased to it’s highest of 492 in 1904 but slipped into a ghost town status by the 60’s. One of Luckenbach’s early residents, a man named Jacob Brodbeck, reputedly built and flew an airplane several years before the Wright Brothers. In1970, Hondo Crouch, a local rancher and Texas folklorist saw an ad in the newspaper- “Town for Sale, Population 3”. He responded and wound up buying the whole town of Luckenbach for $30.000. He was quoted as saying he bought it so he would have a place between Fredericksburg and his ranch a few miles down the road to stop and drink a beer. The town consists of the original Post office building which is now a saloon/general store and a dance hall just across the street. It has several smaller outbuildings and just across the creek, the remnants of a cotton gin that has been completely toted off by tourists. The town had become somewhat famous in 1973 when Jerry Jeff Walker recorded a live album “Viva Terlingua” in the Luckenbach Dance Hall. Luckenbachs popularity reached a fever pitch shortly after Waylon Jennings immortalized it with his song “Luckenbach Texas” in 1977 and the town was suddenly plagued with souvenir hunters carting of everything they could.